Department of Pharmaceutics 1, K. L. E. F., K. L. College of Pharmacy, Vaddeswaram, Guntur - 522502, Andhra Pradesh, India. Department of Pharmaceutics 2, Department of Pharmaceutical Analysis 3, M. A. M. College of Pharmacy, Kesanupalli, Narasaraopet, Guntur - 522601, Andhra Pradesh, India. ABSTRACT: Purpose: The main objective of the present research investigation is to formulate the sustained release formulation of Rosuvastatin. Rosuvastatin, an antihyperlipidemic agent, belong BCS class-II agent. Methods: The SR tablets of Rosuvastatin were prepared to employ different concentrations of HPMCK4M and SCMC in different combinations by direct compression using 32 factorial designs. The concentration of polymers, HPMCK4M, and SCMC required to achieve the desired drug release was selected as independent variables, X1, and X2 respectively whereas, time required for 10% of drug dissolution (t10%), 50% (t50%), 75% (t75%) and 90% (t90%) were selected as dependent variables. Results and Discussion: nine formulations were designed and are evaluated for hardness, friability, thickness, % drug content, in-vitro drug release. From the results, it was concluded that all the formulation were found to be within the Pharmacopoeial limits and the in-vitro dissolution profiles of all formulations were fitted into different kinetic models, the statistical parameters like intercept, slope & regression coefficient were calculated. Polynomial equations were developed for dependent variables. Validity of developed polynomial equations was verified by designing 2 checkpoint formulations (C1, C2). According to SUPAC guidelines the formulation (F4) containing 30 mg of HPMCK4M and 40 mg of SCMC, is the most similar formulation (similarity factor f2 = 89.561, dissimilarity factor f1 = 1.543 and no significant difference, t=0.0056) to marketed product (CRESTOR). Conclusion: The selected formulation (F4) follows zero order, Higuchi’s kinetics, and the mechanism of drug release was found to be non-Fickian diffusion (n= 0.963). INTRODUCTION: Oral administration is the most convenient, popularly used route of administration for both conventional and novel drug delivery systems. In long-term therapy for the treatment of chronic disease conditions, conventional formulations are required to be administered in multiple doses and therefore have several disadvantages 1. A major problem associated with oral administration of formulations is extensive pre-systemic elimination by gastrointestinal degradation and first-pass hepatic metabolism which results in low systemic bioavailability and shorter duration of therapeutic activity and formation of inactive or toxic metabolites 2. Sustained release (SR) tablet formulations offer better patient compliance, maintain uniform drug levels, reduce dose and side effects, and increase the safety margin for high-potency drugs 3. The goal of a sustained release dosage form is to maintain therapeutic blood or tissue levels of the drug for an extended period. This is usually accomplished by attempting to obtain zero-order release from the dosage form. Zero-order release constitutes the drug release from the dosage form that is independent of the amount of drug in the delivery system (i.e., constant release rate). Sustained release systems generally do not attain this type of release and usually try to mimic zero-order release by providing the drug in a slow first-order fashion (i.e., concentration-dependent). Systems that are designated as a prolonged release can also be considered as attempts at achieving sustained release delivery 4, 5, 6, 7. Sustained release products provide an advantage over immediate release dosage form by optimizing biopharmaceutical, pharmacokinetic and pharmaco-dynamic properties of the drug. Sustained release dosage forms have been demonstrated to improve therapeutic efficiency by the maintenance of a steady drug plasma concentration. Among the different sustained release drug delivery systems, matrix-based SR tablet formulations are the most popularly preferred for its convenience to formulate a cost-effective manufacturing technology on a commercial scale. The use of polymers in controlling the release of drugs has become an important tool in the formulation of pharmaceutical dosage forms. Over many years, numerous studies have been reported in the literature on the application of hydrophilic polymers in the development of SR matrix systems for various drugs 8, 9. Natural polymers remain preferred due to numerous advantages such as they are readily available, economical, non-carcinogenicity, be capable of chemical modifications, mucoadhesive, the biodegradable, biocompatible, high drug holding capacity and high thermal stability and ease of compression 10. Various natural gums and mucilages have been examined as polymers for sustained drug release in the last few decades for example; guar gum, tragacanth gum, xanthan gum, pectin, alginates. Semisynthetic polymers (cellulose derivatives) like carboxymethyl cellulose (CMC), sodium carboxymethyl cellulose (SCMC), hydro-propyl cellulose (HPC), and hydroxypropyl methyl-cellulose (HPMC) have been extensively studied as the polymer in the sustained release tablet formulations 9. These polymers are most preferred because of its cost-effectiveness, broad regulatory acceptance, non-toxic and easy of compression. Some factors like molecular size, diffusivity, pKa-ionization constant, release rate, dose and stability, duration of action, absorption window, therapeutic index, protein binding, and metabolism affect the design of sustained release formulation. Oral sustained release dosage form by direct compression is a simple approach of drug delivery systems that proved to be rational in the pharmaceutical arena for its ease, compliance, faster production, avoid hydrolytic or oxidative reactions occurred during processing of dosage forms 11. The selection of the drug candidates for sustained release system needs consideration of several biopharmaceuticals, pharmacokinetic and pharmacodynamic properties of drug molecule 12. In the present study, a sustained release dosage form of Rosuvastatin has been developed that makes less frequent administering of the drug. Rosuvastatin, a potent hypolipidemic agent, belong BCS class-II agent. It is a specific inhibitor (Competitive) of HMG CoA. It has low extrahepatic tissue penetration (the drug acts primarily in the liver). It is sparingly soluble in water. Its bioavailable fraction is 0.20. 90% of protein binding. Vd was found to be 134 L in steady state and primarily eliminated in the feces (90%) compared with 10% renal excretion. 72% of absorbed Rosuvastatin is eliminated in bile and 28% via renal excretion. Thus, there is a need to increase the rate of dissolution. Hence, the study was carried out to formulate and evaluate sustained release dosage form of Rosuvastatin as a model drug and had an aim those final batch formulation parameters should shows prolong drug release 13, 14, 15, 16, 17, 18, 19. Development of dosage form depends on the chemical nature of the drug/polymers, matrix structure, swelling, diffusion, erosion, release mechanism, and the in-vivo environment. It is an important issue to design an optimized formulation with an appropriate dissolution rate in a short period and minimum trials. Many statistical experimental designs have been recognized as useful techniques to optimize the process variables. For this purpose, response surface methodology (RSM) utilizing a polynomial equation has been widely used. Different types of RSM designs include 3-level factorial design, central composite design (CCD), Box-Behnken design and D-optimal design. 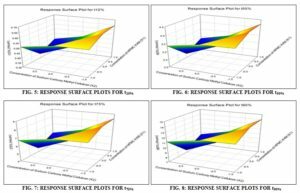 Response surface methodology (RSM) is used when only a few significant factors are involved in experimental optimization. The technique requires less experimentation and time, thus proving to be far more effective and cost-effective than the conventional methods of formulating sustained release dosage forms 20. Hence, an attempt is made in this research work to formulate sustained release (SR) tablets of Rosuvastatin using HPMCK4M and SCMC. Instead of the normal and trial method, a standard statistical tool design of experiments is employed to study the effect of formulation variables on the release properties. Large scale production needs more simplicity in the formulation with economic and cheapest dosage form. A 32 full factorial design was employed to study the drug release profile systematically. A 32 full factorial design was employed to investigate the effect of two independent variables (factors), i.e. the amounts of HPMCK4M and SCMC on the dependent variables, i.e. t10%, t50%, t75%, t90%, (Time taken to release 10%, 50%, 75%, 90% respectively). MATERIALS AND METHODS: Materials used in this study were obtained from different sources. Rosuvastatin was a gift sample from Konis Pharma Ltd., Baddi, India. HPMCK4M, SCMC, Lactose were procured from Amna Pharmaceuticals, Surat. Another excipient such as magnesium stearate was procured from Loba Chemie Pvt. Ltd., Mumbai. Formulation Development of Rosuvastatin Sustained-Release Tablets: The factorial design is a technique that allows identification of factors involved in a process and assesses their relative importance. Also, any interaction between the factors chosen can be identified. Construction of a factorial design involves the selection of parameters and the choice of responses 21. A selected three level, two factor experimental design (32 factorial design) describe the proportion in which the independent variables HPMCK4M and SCMC were used in formulation of Rosuvastatin sustained release (SR) tablets. The time required for 10% (t10%), 50% (t50%), 75% (t75%) and 90% (t 90%) drug dissolution were selected as dependent variables. Significance terms were chosen at 95% confidence interval (P<0.05) for final equations. Polynomial equations were developed for t10%, t50%, t75%, t90%, (step-wise backward Linear Regression Analysis) 22. The three levels of factor X1 (HPMCK4M) at a concentration of 10%, 15%, 20%. Three levels of factor X2 (SCMC) at a concentration of 10%, 15%, 20%. (% concerning total tablet weight) Was taken as the rationale for the design of the Rosuvastatin SR tablet formulation. Nine Rosuvastatin sustained release tablet formulations were prepared to employ selected combinations of the two factors, i.e. X1, X2 as per 32 factorial and evaluated to find out the significance of combined effects of X1, X2 to select the best combination and the concentration required to achieve the desired prolonged / sustained release of drug from the dosage form. Preparation of Rosuvastatin Sustained-Release Tablets: All ingredients were collected and weighed accurately. They were mixed uniformly in poly bag for 10-15 min. The powder blend was passed through sieve no. 44. Add magnesium stearate and then again blend for 5-6 min and subjected compression by using rotary tablet punching machine. Compressed tablets were examined as per official standards and unofficial tests. Tablets were packaged in well-closed light resistance and moisture proof containers. Experimental Design: Experimental design utilized in present investigation for the optimization of polymer concentration such as the concentration of HPMCK4M was taken as X1 and concentration of SCMC was taken as X2. The experimental design was given in Table 1. Three levels for the concentration of HPMCK4M were selected and coded as -1= 10%, 0=15%, +1=20%. Three levels for the concentration of SCMC were selected and coded as -1= 10%, 0=15%, +1=20%. Formulae for all the experimental batches were given in Table 2. Friability: The friability of the tablets was measured in a Roche friabilator. Tablets of known weight (W0) or a sample of 20 tablets are degusted in a drum for a fixed time (100 revolutions) and weighed (W) again. Percentage friability was calculated from the loss in weight as given in equation as below. The weight loss should not be more than 1%. Content Uniformity: In this test, 20 tablets were randomly selected, and the percent drug content was determined, the tablets contained not less than 85% or more than 115% of the labeled drug content can be considered as the test was passed. Assay: The drug content in each formulation was determined by triturating 20 tablets, and powder equivalent to 40 mg was dissolved in 100 ml of phosphate buffer pH 7.4, followed by stirring. The solution was filtered through a 0.45 μ membrane filter, diluted suitably, and the absorbance of the resultant solution was measured spectrophotometrically at 245 nm using phosphate buffer pH 7.4 as blank. Thickness: Thickness of all tablet formulations were measured using Vernier calipers by placing tablet between two arms of the Vernier calipers. In-vitro Dissolution Study: The in-vitro dissolution study for the Rosuvastatin sustained release tablets were carried out in USP XXIII type-II dissolution test apparatus (Paddle type) using 900 ml of 0.1 N HCl as dissolution medium for first two hours followed by phosphate buffer pH 7.4 at 50 rpm and temperature 37 ± 0.5 °C. At pre-determined time intervals, 5 ml of the samples were withdrawn using a syringe fitted with a pre-filter, the volume withdrawn at each interval was replaced with the same quantity of fresh dissolution medium. The resultant samples were analyzed for the presence of the drug release by measuring the absorbance at 245 nm using UV-Visible spectrophotometer after suitable dilutions. The determinations were performed in triplicate (n=3). Kinetic Modeling of Drug Release: The dissolution profile of all the formulations was fitted into zero-order, first-order, and Higuchi and Korsmeyer-Peppas models to ascertain the kinetic modeling of drug release 8, 23, 24. RESULTS AND DISCUSSION: Sustained release tablets of Rosuvastatin were prepared and optimized by 32 factorial design to select the best combination of different polymers, HPMCK4M, SCMC and also to achieve the desired prolong/sustained release of drug from the dosage form/formulation. The two-factorial parameters involved in the development of formulations are the quantity of HPMCK4M and SCMC polymers as independent variables (X1, X2), and in-vitro dissolution parameters such as t 10%, t 50 %, t75% and t90% as dependent variables. Nine formulations were prepared using three levels of 2 factors and all the formulations containing 20 mg of Rosuvastatin were prepared as a sustained release tablet dosage form by direct compression technique as per the formulae are given in Table 2. All the prepared tablets were evaluated for different post-compression parameters, drug content, mean hardness, friability, mean thickness as per official methods and results are given in Table 3. The mean hardness of tablets was in the range of 3.5 ± 0.5-4.07 ± 0.21 kg/cm2. The mean thickness of all formulations was founded to be in the range of 2.45 ± 0.15-2.86 ± 0.14 mm. Weight loss in the friability test was less than 0.51%. Drug content of prepared tablets was within acceptance range only. Results for all post-compression parameters were tabulated or summarized in Table 3. In-vitro dissolution studies were performed for prepared tables using 0.1 N HCl for the first two hours followed by phosphate buffer pH 7.4 as a dissolution media at 50 rpm and temperature 37 ± 0.5 °C. The in-vitro dissolution profiles of tablets were shown in Fig. 1-4 (Kinetic plots) and the dissolution parameters were summarized in Table 4. Cumulative % drug release of factorial design formulations F1-F9 at 12 h was found to be in the range of 86.87-99.61%. From the result, it reveals that the release rate was higher for formulations containing a low level of HPMCK4M compared with other formulations containing higher level, due to the high concentration of polymer-drug may have entrapped within a polymer matrix causing a decrease in the rate of drug release. Therefore, the required release of drug can be obtained by manipulating the composition of HPMCK4M and SCMC. Many variations was observed in t10%, t50%, t75% and t90% due to formulation variables. Formulation F4 containing 35 mg of HPMCK4M, 60 mg of SCMC showed promising dissolution parameter (t10% = 0.350 h, t50% = 2.268 h, t75% = 4.537 h, t90% = 7.530 h). The difference in the burst effect of the initial time is a result of the difference in the viscosity of the polymeric mixtures. As the increase in viscosity results in a corresponding decrease in the drug release, which might be due to the result of thicker gel layer formulation 25. The in-vitro dissolution data of Rosuvastatin SR tablet formulations was subjected to the goodness of fit test by linear regression analysis according to zero order and first order kinetic equations, Higuchi’s and Korsmeyer-Peppas models to assess the mechanism of drug release. The results of linear regression analysis including regression coefficients are summarized in Table 4 and plots shown in Fig. 1, 2, 3, 4. It was observed from the above that dissolution of all the tablets followed zero order kinetics with coefficient of determination (R2) values above 0.993 (0.993-0.999). The values of r of factorial formulations for Higuchi’s equation was found to be in the range of 0.942-0.975, which shows that the data fitted well to Higuchi’s square root of time equation confirming the release followed diffusion mechanism. Kinetic data also treated for Peppas equation, the slope (n) values range from 0.524 - 0.962 that shows non-Fickian diffusion mechanism. Polynomial equations were derived for all dependent variables by backward stepwise linear regression analysis using PCP Disso software and Response surface plots were constructed using SIGMAPLOT V13 software. 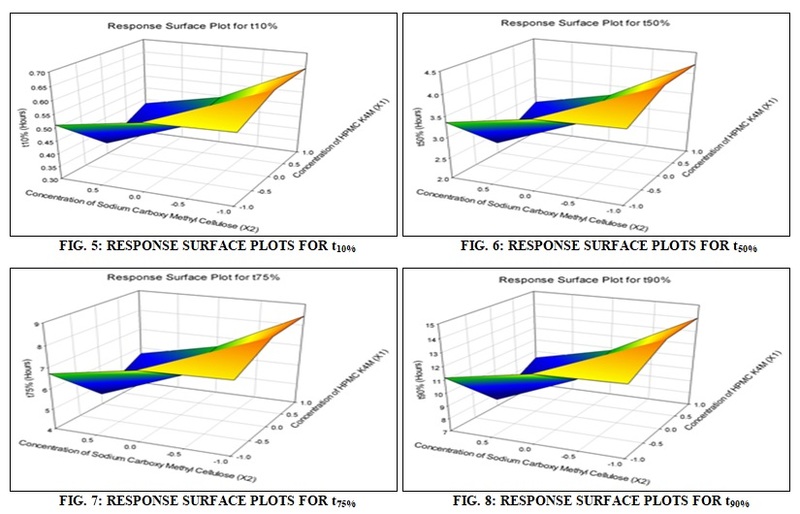 The response surface plots were shown in Fig. 5-8 for t10%, t50%, t75% and t90% using X1 and X2 on both the axes respectively. The dissolution data (Kinetic parameters) of factorial formulations F1 to F9 were shown in Table 5. Y= b0+b1X1+b2X2+b12 X1X2+b11 X12+b22 X22….. The positive sign for coefficient of X1 in Y1, Y2, Y3, and Y4 equations indicates that, as the concentration of HPMCK4M increases, t10%, t50%, t75% and t90% value increases. In other words, the data demonstrate that both X1 (amount of HPMCK4M) and X2 (amount of SCMC) affect the time required for drug release (t10%, t50%, t75%, and t90%). From the results, it can be concluded that, an increase in the amount of the polymer leads to decrease in the release rate of the drug and drug release pattern may be changed by appropriate selection of the X1 and X2 levels. The dissolution parameters for predicted from the polynomial equations derived and those actual observed from experimental results are summarized in Table 6. The closeness of predicted and observed values for t10%, t50%, t75%, and t90% indicates the validity of derived equations for dependent variables. The response surface plots were presented to show the effects of X1 and X2 on t10%, t50%, t75%, and t90%. The final best (Optimised) formulation (F4) is compared with a marketed product (CRESTOR) shows similarity factor (f2) 89.561, difference factor (f1) 1.543 (There is no significant difference in drug release because tcal is<0.05). CONCLUSION: The present research work envisages the applicability of polymers such as HPMCK4M and SCMC in the design and development of sustained release tablet formulations of Rosuvastatin utilizing the 32 factorial designs. From the results, it was clearly understood that as the retardant (HPMC) concentration increases the release rate of drug was retarded and both of these polymers can be used in combination since do not interact with the drug which may be more helpful in achieving the desired sustained release of the drug for longer periods. The optimized formulation followed Higuchi’s kinetics while the drug release mechanism was found to be non-Fickian diffusion, zero order release type, controlled by diffusion through the swollen matrix. By evaluation parameters, the optimized formulation F4 may be used once a day administration in the management of hypercholesterolemia and to reduce the risk of cardiovascular disease. This may improve patient compliance by reducing the dosing frequency. Which will ultimately improve the therapeutic outcome? We could be able to minimize the per oral cost of the formulation. ACKNOWLEDGEMENT: The author would like to thank the Management & Staff of K. L. College of Pharmacy, Vaddeswaram, Guntur, Andhra Pradesh, India for providing support for the successful completion of research work. Jain S, Mehra NK, Singhai AK and Saraogi GK: Development and evaluation of sustained release matrix tablet of Lamivudine. Int J Pharm Sci Res 2011; 2(1): 454-461. Singh RR: Design, formulation and in-vitro evaluation of Lamivudine HCl sustained-release Int J Res Pharm Nano Sci 2014; 3(2): 113-121. Gunda RK, Kumar JNS, Babu CA and Anjaneyulu MV: Formulation development and evaluation of Lamotrigine sustained release tablets using 32 factorial design. Int J Pharm Sci Res 2015; 6(4): 1746-1752. Bankar GS and Rhodes CT: Modern Pharmaceutics. Marcel Dekker, Inc. New York, Edition 3rd, 1996: 668-9. Lachmann L, Lieberman HA and Kanig JL: The theory & practice of industrial pharmacy. Varghese Publishing House, Bombay, Edition 3rd, 1991: 430. Gunda RK and Kumar JNS: Formulation development and evaluation of Zidovudine sustained release tablets using 32 factorial design. Der Pharm Sin 2015; 6(6): 59-67. Kumar JNS, Satyaprasad B, Venkateswarlu G, Brahma CK and Gunda RK: Formulation development and evaluation of metoprolol succinate sustained release tablets using 32 factorial design. Der Pharm Let 2015; 7(7):148-57. Gunda RK: Formulation development and evaluation of Rosiglitazone maleate sustained release tablets using 32 factorial design. Int J Pharm Tech Res 2015; 8(4): 713-24. Gunda RK, Kumar JNS, Brahma CK and Viragandham S: Design, formulation and evaluation of Lamivudine con-trolled release tablets. Pharm Bio Eva 2015; 2(4): 110-121. Prakash P, Porwal M and Saxena A: Role of natural polymers in sustained release drug delivery system: application and recent approaches. Int Res J of Pharmacy 2011; 2(9): 6-11. Gunda RK, Kumar JNS, Brahma CK, Satyanarayana V and Prashant KN: Design, formulation and evaluation of Atenolol gastro retentive floating tablets. Asian J Pharm 2015; 9(4): S34-S42. Rhodes CT and Robinson JR: Sustained and controlled drug delivery system. Modern Pharmaceutics, Marcel Dekker, USA, Edition 4th, 2003: 503-505. Vidya NK, Chemate SZ and Dharashive VM: Formulation development and solubility enhancement of Rosuvastatin calcium tablet prepared by complexation with β-cyclodextrin by kneading method. Int J Pharm Sci Res 2016; 7(12): 4882-4892. Gupta MM, Pandey S, Chauhan BS and Gupta N: Design, development and evaluation of Rosuvastatin calcium and Diltiazem hydrochloride bilayer tablet using combination concept of sustained layer with conventional Turk J Pharm Sci 2014; 11(3): 269-284. Sanjana A and Ahmed MG: Development and in-vitro evaluation of Rosuvastatin tablets by floating drug delivery system. Asian J Pharm 2017; 11(2): S260- 64. Sreelatha P, Babu SM and Rao YRJ: Formulation and evaluation of matrix type Rosuvastatin Sustained release tablets. Int J Pharm Ana Res 2014; 3(4): 370-383. Sarfraz RM, Ahmad M, Mahmood A, Minhas MU and Yaqoob A: Fabrication and evaluation of Rosuvastatin calcium fast disintegrating tablets using β-cyclodextrin and super-disintegrants. Trop J Pharm Res 2015; 14(11): 1961-68. Ul Quasim SZ, Naveed A, Abbas SA and Irfan MA: Formulation and evaluation of Rosuvastatin calcium oral floating tablets. Res J Pharm Tech 2012; 5(11): 1389 -92. Sarfraz RM, Ahmad M, Mahmood A, Minhas MU and Yaqoob A: Development and evaluation of Rosuvastatin calcium based microparticles for solubility enhancement: An in-vitro Advances in Poly Tech 2017; 36(4): 433-441. Gunda RK, Kumar JNS, Satyanarayana V and Satyprasad B: Formulation development and evaluation of Carvedilol phosphate gastro retentive floating tablets. Int Res J Pharm 2016; 7(1): 44-51. Kharia AA, Hiremath SN, Singhai K, Omray K and Jain K: Design and optimization of floating drug delivery system of Acyclovir. Ind J Pharm Sci 2010; 72(5): 599-06. Gunda RK, Manchineni PR and Dhachinamoorthi D: Design, development, and in vitro evaluation of sustained release tablet formulations of Olmesartan medoxomil. MOJ Drug Des Develop Ther 2018; 2(3): 164-169. Higuchi T: Mechanism of sustained-action medication. Theoretical analysis of rate of release of solid drugs dispersed in solid matrices. J Pharm Sci 1963; 51: 1145-9. Peppas NA: Analysis of Fickian and non-Fickian drug release from polymers. Pharm Acta Helv 1985; 60: 110-1. Dortunc B and Gunal N: Release of Acetazolamide from swellable HPMC matrix tablets. Drug Dev Ind Pharm 1997; 23: 1245-9. Gopaiah KV, Rao GSNK, Gunda RK and Manchineni PR: Design, formulation and evaluation of sustained release tablets for antihyperlipidemic agent. Int J Life Sci & Rev 2018; 4(12): 202-10. doi: 10.13040/IJPSR.0975-8232.IJLSR.4(12).202-10.